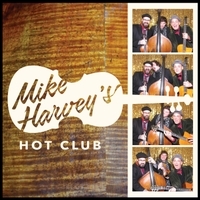 Mike Harvey’s Hot Club employs the acoustic string instrumentation of gypsy jazz from the 1930s, but moves it into today’s context, drawing repertoire and a playing style not only from the classic sound, but from many places, both past and present. Recorded by Mike Harvey, assisted by Jacob Kohlman at Nola Recording Studios. Performed live, one room, no overdubs. Mixed and mastered by Mike Harvey. Photos and layout by Mike Harvey and Ashley Tran at spoofphotobooths.com.